When it’s time to replace your roof, you may be looking to do it yourself and save money, but roofing can be a dangerous task. The height, lack of safety knowledge, lack of specialist equipment and the fact that a roof can become unstable during replacement are just a few major reasons why replacing the roof yourself can be dangerous. However, roofs get damaged over time, you may see a leak in your roof, it could be damaged in a storm or it is just plain getting old. Then your roof will need to be replaced or repaired. The question is how do you know if you should be hiring a professional roofing company or doing it yourself? If you want to know that your roof will be replaced or repaired correctly, then hiring a professional would give you that peace of mind. Professional roofing companies have access to all the right materials and tools for the job. Plus, they have years of experience to do the job correctly. Professionals are also able to inspect the property and advise you if there is anything else wrong with the roof that would need to be repaired. Let’s say a few shingles knocked loose in a storm, and you hired a roofing company to replace the shingles that knocked loose. Any other damage done to your roof by the storm may have not been visible to your untrained eyes, but a professional roofing contractor would be able to tell after an inspection. This does not mean that your roofing contractor will spring surprise costs on you. A good roofing contractor will offer a thorough quote or estimate before beginning any work, so you know exactly how much the services cost and why these repairs are being done. A great bonus to having a professional roofing company is that their replacements are usually covered by warranties. These warranties can offer you peace of mind in case anything goes wrong within the time span outlined in the warranty agreement, and will potentially save you money if something does go wrong. Most warranties are only valid if installed by a professional. Putting yourself in danger is one of the last things that a homeowner wants, getting on the roof yourself can be very dangerous, by hiring a professional company to replace or fix your roof will save yourself the trouble of putting yourself in danger. Replacing or fixing your roof yourself comes with some caveats. Firstly, as mentioned previously, it can be a very dangerous task for someone who is untrained to replace a roof. Roofers are up and walking around on roofs every day and are trained to do so safely. They know how to navigate around any dangerous situations and they know how to keep themselves out of danger. Besides being up high on your roof, there are other construction-related safety issues to be concerned about. Another downside to replacing your roof yourself is that you probably do not have the experience or know how to get the job done correctly. Your roof is such an important part of the infrastructure of your house and you want to make sure that a repair or replacement is stable and durable. If a small leak is not fixed the right way, it could escalate into a much bigger problem. Small repairs might be the only situation that might work out in your favor when doing it yourself. For example, it may be easier and more cost-effective than hiring a professional if you only have a shingle or two to replace, or if you have a small leak that just requires sealant. When debating whether to hire a professional to fix/replace your roof or whether to just do it yourself, there are many factors to take into consideration. Overall, you want to make sure that your repair or replacement is done right so that your roof can last, and not cause any problems in the future. The professionals at Infinite Roofing have the experience and expertise you need to get your roof replacement done right. It is important to pick up on the warning signs of a failing roof, but what are the characteristics that you should be looking for? Listed below are the signs that you should be looking for when inspecting a roof. If any of them pop up it is very likely that your roof needs to be looked at by an Albany roofing company that can determine if you need a roof replacement. Curled or Buckled shingles are a huge sign that your roof has some age on it and it may be time for a roof replacement. The moisture in the attic space can force nails to push up and out of the roof’s decking, causing the shingles to buckle. This can cause a lot of problems. It can leave your house exposed to the elements outside and it increases the chances of shingles blowing off during a storm. Shingles are hard to replace so calling an Albany roofing company to give you a free estimate would give you an idea of how much it may end up costing. Bacteria is another leading cause of roofs failing. Tar streaking and algae growth are caused by bacteria eating away at the shingles weatherproofing properties. Some cheap manufacturing companies use limestone fillers to keep the cost of the shingle production low. Limestone isn’t the greatest when it comes to protection against algae. The algae will eat through the limestone and cause your roof to have black streaking which will compromise the weatherproofing properties causing you to have an entire roof replacement done. Missing granules are a sure sign that your roof is dramatically losing its weatherproofing properties. To check to see if you are missing granules, check your gutters for granule build up, if that’s something you are unsure about how to do, always give your Albany commercial roofing or residential roofing company a call to come and look at. You can also check your downspout splash pan for granules or sometimes you can shake it and if you hear a rattling this is another sign that your shingle’s granules are falling off. Ventilation in the attic is very important, warm air in your house rises and if not vented out properly, the warm air can get trapped in the attic. When that happens, condensation develops on the inside of your roof. This can cause rusty nails and eventually mold buildup if it has not been looked at by a professional Albany roofing company. Unfortunately, if left long enough the plywood would rot out and you’ll be stuck having to get a full roof replacement. Even if you have a new roof, don’t think this problem isn’t something that you need to worry about. This can happen with new or old roofs as some people may over insulate their homes to prevent from getting high energy bills but that also ends up blocking the vents. Just like a car, a home needs an appropriate intake (soffits) and exhaust (ridge vent). Mold is an extreme health hazard, so if that is something that you came across, do not try tackling it yourself. Seek out an Albany roofing company to take care of this situation with their expertise and the right equipment. You should act now to prevent the extra costs of having to replace all the affected wood as well. Mold, if not acted upon in a timely manner, could end up costing you an entire roof replacement. Missing shingles are the biggest and the easiest one to figure out when it comes to knowing if you need a roof replacement. If you have missing shingles that allows anything a pathway into your house. Contacting an Albany roofing company to inspect the situation as soon as possible would be the best advice. Is there light coming in through your roof? The best way to check that would be to go up to the attic and turn all the lights off to see if there are any holes that are letting the light in. If that is the case you may want to call a commercial roofing company to get a roof replacement. If you see light streaking from the roof’s decking, you may have a big problem as this means the nails have fallen through or the corrosive materials used have lost their weatherproofing properties (i.e. flashing, collars, and step flashing). Your attic temperature is supposed to be very similar to the outdoor temperature as your attic should have enough ventilation that lets air circulate in and out of the attic. If the ventilation system in the attic fails to do this job and the attic is warmer than the outside temperature, then there is a possibility of ice dams forming. Your home is prone to ice dams. You may also see signs of blistering/peeling of exterior paint due to poor attic ventilation. Your roof and chimney should be properly flashed so that your home is sealed away from the elements. Making sure that your chimney has been flashed correctly is crucial so if you see any water leaked around your chimney that would indicate that the chimney hasn’t been flashed correctly and is no longer performing. You want to make sure your commercial roofing company has used a leak barrier to provide protection against leaks in vulnerable areas, and on all areas of your roof including eaves, rake and side walls. High heating and cooling bills can be from energy escaping due to poor ventilation and insulation in your home, especially in your attic and roof. If you notice you have high energy bills in addition to any of the warning signs listed above, it could be because your roof is under-performing and getting in a commercial roofing contractor to come and inspect the roof would help solve that problem. Thinking that you just had a new roof done a couple of years ago and that nothing could happen to it is a misconception. People usually think that a roof lasts about 10 to 15 years but if there is misapplication or sub-par materials were used, the age means absolutely nothing. Use the tips above to always keep an eye on your roof and make sure it is functioning properly and lasts the full lifespan that it is meant to. If you think your roof is nearing the end of its lifespan, contact us today for a FREE estimate at 518-444-ROOF, and as your local Albany roofing company, we will be more than willing to come out to your house and take a look at the problem. We will provide the best service to fix any issues and get your roof looking and functioning as good as new! As flowers start to blossom, the temperatures start rising and families are spending more time outside taking advantage of the warmer weather, you know it’s springtime! With spring approaching, many people like to take part in what is called “spring cleaning”. It is a great way to prepare for the year ahead. People can clean out their closets, give the house a thorough cleaning inside out, give the landscape a makeover and plant a beautiful garden to enjoy all summer. It isn’t too often that people think about cleaning their roofs. That should be the least of your worries, right? But this is just as important as any other spring cleaning task, if not more so. Especially after the winter months. Many people don’t know what a spring cleaning checklist for roofs would look like, and that is why we’ve put together a list that would help accomplish the spring cleaning for your roof and have it be ready for the summer months to come. Your roof should be maintained on a yearly basis. Gutters should be the first thing to tackle when thinking about giving your roof that spring makeover. The fact that winter just passed makes it very likely that the gutters are clogged with rotting leaves and a lot of debris. It is frustrating thinking that you may have just cleaned your gutters in fall, but time does take its toll and in order for the gutters to do their job they need to be cleaned thoroughly and in a timely manner to maintain the integrity and durability of your roof. If the draining system isn’t working properly then it’s likely that your shingles, siding, soffits and more will be vulnerable to damage. It is always better to maintain and clean ahead rather than ignoring your roof and gutters than be faced with a larger problem in the future that you may need to hire a roofing contractor for. The first step to cleaning out your gutters would be to take a sturdy ladder and clean all the debris from the gutters. Once you’ve cleaned out everything visible to you on the surface, move on to the downspout. This is the more complicated step when it comes to cleaning the gutters, but also the most important one, as this is what actually drains the water away from your house. Try running water through it using a hose or plumbers snake to unclog. If all else fails; take it apart, find the source and then put it back together. Doing these steps thoroughly should take care of gutter maintenance and cleaning. Shingles are the first line of defense on your roof. They’re the small, overlapping rectangular pieces that layer together to cover your roof. While not all buildings utilize shingles, most residential homes do. When you’re working through your roof repair checklist, make sure to pay special attention and examine them. There are a number of things to watch out for, but try to do an examination as best as you can from the ground. Getting on your roof can be dangerous and should be avoided if at all possible. Hiring an Albany roofing contractor would be the safest choice, but if you do need to get up on the roof, make sure to follow every safety procedure. Once you are on the roof check for missing shingles. If you find any missing you should get it replaced immediately by a roof repair company. A missing shingle can expose your roof to infrastructure damage such as flooding, mold, and rot. The other thing you need to look for when inspecting the roof is any stains or signs of streaking on the shingles. If there are stains, that usually indicates that there is a leak somewhere or that the ventilation system is damaged. This is a problem that needs to be dealt with by a professional Albany roofing contractor so that the underlying cause of the problem is determined and fixed. You may not think that branches could harm your roof but it is one of the biggest threats your roof can face. The best way to avoid damage from your yard’s trees is to trim the branches back. Again, this can be a dangerous job if you don’t have the proper equipment or if you have hard to reach higher areas. Consider calling a professional Albany roofer for any jobs that you think may not be safe for you. The added benefit of trimming the branches of nearby trees is that you’ll spend less time raking out leaves from your gutters in the future. Taking care of this step during the spring is also much easier than waiting until everything is in full bloom. Always look out for mold or mildew when inspecting your roof,. If it’s caught early enough it can easily be fixed but if not kept in check the mold can seep in deeper and cause some major problems. You can use some home remedies to control the mold if it’s only a small patch, but if it covers a larger area it is recommended to call in an Albany roofing service as it is more than likely that the mold seeped in deeper and is affecting some of the major structure of the roof. Often this step is overlooked as everything may look fine from outside, but it is extremely important to check your roof from the inside. You can often identify problems that can’t be seen from even the most thorough inspection outside. Your first move when checking the inside should be to go up to the attic and check for any light source. If you see light shining in from outside, this means there may be a hole in the roof. Also, check for any mold or mildew or any smell that may be damp or doesn’t seem to be normal. If you do find anything out of the ordinary inside, it may mean that there is a problem somewhere that you can’t see. Call an Albany roof repair company to get it thoroughly checked. While some people may attempt to work through this spring cleaning checklist on their own, untrained eyes often overlook things and getting up on your roof can be dangerous. When you hire a professional Albany roofer, not only will the entire process move more quickly, but you’ll be sure that nothing was missed during the inspection. Albany roofing professionals like the ones at Infinite Roofing and Construction have the experience and expertise to provide you with a comprehensive inspection both inside and out. Once you’ve cleaned your gutters and trimmed your branches, give our experienced roofers a call so that you can tackle any underlying issues immediately and avoid further damage. Remember, if you’re not trained to see specific problems it’s very easy to miss them, so get a professional roofing service to come out and look for you. Don’t pass on your yearly inspection! Spring is the perfect time for repairs and preparation for the warm summer months. When you hire an experienced roofing contractor from Infinite Roofing, we can guarantee that the job will be done efficiently and with no hidden costs. We aim to repair only what’s needed and preserve all areas of your roof that are still in good condition. Seeking out a roof repair company for small jobs will provide a sense of calm when it comes to maintaining your roof for a long time. Most the time a lot of roof repair companies would make your job easy and take care of the whole roof repair process from start to finish. There are a lot of Albany roofing contractors, but if you need a professional service from an experienced Albany roofing service, please call (518)-444 ROOF at Infinite Roofing and Construction and we will take care of your roof using our residential or commercial roofing contractors and help you cross off everything from your roof repair checklist! Hiring a local Albany roofing contractor would not only make your job easy but you can also get a couple of quotes from different roofing companies in Albany for comparison. You will find Infinite Roofing‘s quote highly competitive and their service second to none. Weather is an extremely strong force of nature, every year there are thousands of weather phenomenon that occur throughout the year that cause damage in many ways. Businesses, people’s houses and things they own get destroyed due to these storms. You as a homeowner don’t want to be the person whose house and belongings are affected by the weather. Prepare yourself ahead for unpredictable weather. Start by weatherproofing your roof as that is the first thing that comes in contact with the harshness of weather and is most likely to be affected. Homeowners know that top quality roofing is what keeps your home dry and prevents any serious damage from weather, but even then quality roofing can only go so far to fight off the elements that it is put through on a daily basis. Without maintenance, even the good quality roofing can succumb to the forces of nature as easily as the low-quality stuff that most of us try to avoid. If your roof is a low quality you might want to think about replacing the entire roof and have a complete roof replacement done. On the other hand, if you already have a top-notch, durable and long-lasting roof and want to further weatherproof your home, we have some ideas that will help. Serious buildups of ice are called ice dams, they can often overwhelm gutters and clog up your roof systems so that it doesn’t function properly. If ice dams is a problem you suffer from frequently then deicing cables is the perfect solution to your problem and will protect your roof. The cables are fairly easy to install and they work to break up the ice before it can build up too much. Deicing cables basically mean heating cables that run on electricity to warm up. When plugged in, it heats up to the ideal temperature to melt the ice. Installing deicing cables isn’t all too difficult—you can do them yourself as long as you are confident doing some hefty DIY projects and comfortable climbing up safely on the roof. The cables are mounted underneath existing shingles to keep them from causing a leak. Mount the cables in a series of locations over the section that builds up with most ice. 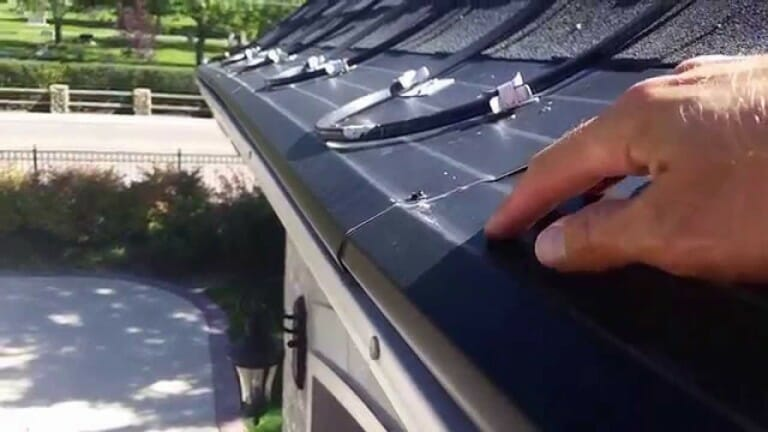 Make sure that the cables dip down the gutter a bit and run it down through the downspout as well to help warm it a bit and to get the water to flow downwards and out the gutter. On the other side run the cable down to an exterior plus and plug it in when you need power and unplug when not in use. 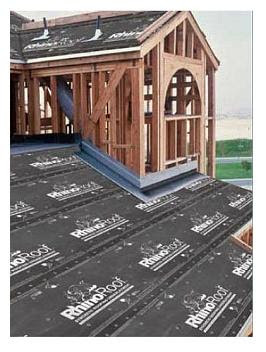 Most roofing companies use tar paper for their roof underlayment installation. It is cheap and is easy to put on. Cheap and easy doesn’t mean it’s the right option for your home. If you are considering having your roof replaced and have a new one installed, consider using the peel and stick underlayment. The installation for this product is extremely easy as it doesn’t require any nails or such. It works with a pre-applied adhesive that sticks when adhered. Peel and stick are also far more flexible than tar paper making it more resistant and durable over time. The best scenario would be to use this underlayment throughout your roof, but just putting it around the edges where the roof takes the most damage from ice buildup and wind would be ideal too. It sure is more expensive than using tar paper, but for the added protection and durability it is worth the added expense. Usually, attic insulation isn’t a big concern when it comes to weatherproofing your roof, but if you live in the northern areas and in the colder climate it does make a difference. Let’s say that your roof is covered in snow, and if too much hot air escapes through your roof the snow will melt and form ice. Ice forming on your roof is a problem that everyone should be concerned about as ice damages your roof. To avoid this issue, installing quality insulation in the attic will keep the heat inside reducing the chances of any ice forming on the roof and on top of that you would be reducing your heat bill as the insulation will keep the heat trapped in the house and letting it not escape. Less heat escaping would lead to using less heat, reducing your bills and saving you some money. The gutters play a very important part when weatherproofing, they provide a way and act like a highway for all the water to go downspout and away from your home. Gutters need to be checked every season to make sure there is no debris clogging up the gutters. If there is that can create a problem. You want to avoid any of those problems by maintaining the gutters and adding extra safety measures to protect yourself from any mishaps happening in the future. If your house is surrounded by many trees and you are worried about leaves clogging up the way consider getting gutter guards. These grates or cages are installed over top of your gutters to keep leaves and other large debris from collecting, and the water keeps flowing freely underneath the guards. 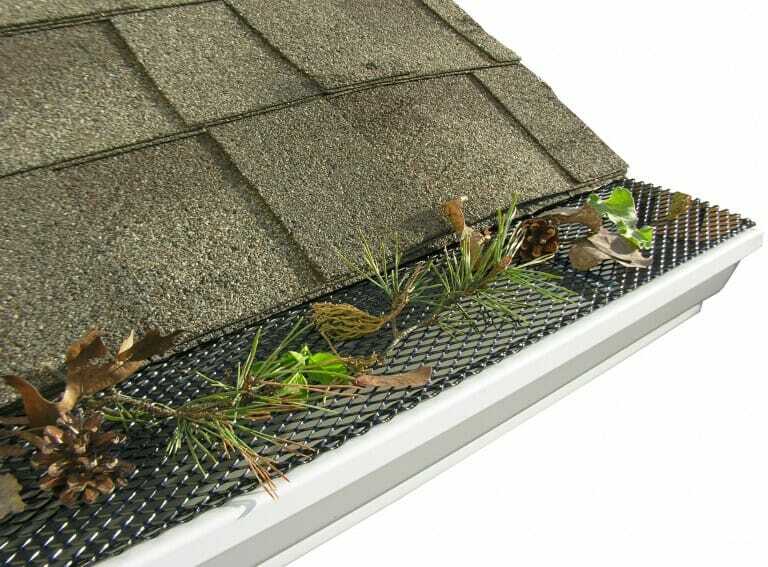 With gutter guards, most of the debris will fall on top of the guards and eventually blow off with the wind, anything remaining can be taken care of easily by a broom. They are also extremely easy to install and you can do that yourself. Here’s to your new and improved weatherproof roof! At Infinite Roofing we are very experienced when it comes to roofing and dealing with the mess left behind by other roofing contractors. This experience did not come easy and unfortunately roofing is a mostly non-reputable industry. There are out of town storm chasers looking to collect checks and never come back, contractors that will request more money before the job is done, roofers that do not have the manpower and end up leaving roofs half open over night when rain is coming and properties are extensively damaged from them not properly “drying in”. Roofing companies that will intentionally quote for quality materials and then use the cheapstuff. Home owners tell us all sorts of horror stories about their previous roofing contractors. Hopefully this will help to inform you about some red flags to look out for. Many of us here at Infinite Roofing started out working as laborers years ago for some other not so notable roofing companies, doing all the hard graft like carrying shingles up and down ladders. Over the years, we’ve seen it all. We have learned all the ways other roofing companies will try to rip you off! Most roofing companies will offer a select amount of pieces of plywood replaced for free and then offer additional pieces of plywood replaced for an additional cost to the homeowner. The problem that can arise in this situation is that most homeowners are not home while the roofing project is being completed. So when the roof is torn off and a non-reputable roofer sees that there is only 2 sheets of plywood that needs replacing, he will add additional sheets and tell the homeowner that 12 sheets were replaced. The current market price of pieces of plywood are replaced at anywhere from $40 to $75. If someone is charging you for 10 sheets of new plywood but only replaced 2, then they have ripped you off $400-$750 and you would never have any way of telling because you were not present during the install. In order to protect yourself from being ripped off this way there are a few things you can do. One would be to stay home and count the amount of plywood that has been torn off and replaced as the job is taking place. Another would be to go up in your attic or crawl space and look at the ceiling or bottom of the roof. If it is unfinished with no sheetrock then you should be able to see the plywood decking. Any new plywood will look significantly different from a plywood material that is over 20 years old. The new plywood will usually just be a brighter color. It can also be different makes such as OSB and the difference in appearance can be easily recognized against plywood. When most roofing companies write a contract, it will include six feet of ice and water barrier along the bottom edges of your roof to prevent ice damns from causing leaks in side your house. To achieve six feet of this protection, roofing contractors will install two courses of a three foot roll. Ice and water barrier is an expensive underlayment and the difference in cost between installing one course and two courses can be at least a few hundred dollars depending on the size and complexity of the roof. Many roofing companies that offer you the lowest price to complete your roof will not want to factor in this cost and will usually end up only using one course of ice and water. Most roofing companies in the Albany NY and Saratoga Springs area, know that six feet is required but will choose to install three. Most local building codes call for 24″ of ice and water protection installed past the warm wall. The problem here is that most roofs have a 18″ – 24″ overhang at the eaves. This is why we prefer to and will always go above and beyond the code. Infinite Roofing backs up our work with a ten year warranty and we do not want to be responsible for a leaking roof. Once the ice and water is installed over a 24″ overhang it only leaves 12″ above the warm wall. This will cause the roof to leak after the ice continuously melts and refreezes again causing ice dams that causes water to be pushed up under the shingles further and further every time it melts and refreezes. One course of ice and water will eventually cause leaks. The roof may not leak the first year but could last 10-15 years before the leaks start damaging the plywood decking, framing, Sheetrock and finish trim. This will either be a very costly roof repair job or it might just make economical sense to replace the whole roof prematurely and losing out on at least a few good years of roof life expectancy. The only way to prevent being ripped off in this manner is to stay home during the roof replacement and watch to make sure that two courses of ice and water are installed. Here at Infinite Roofing, in most situations we will have the old shingles completely torn off the house by 10 am. By 12 o’clock noon, the whole house should be covered in underlayments. So sometime in between 11am and 12 would be a good time to take a walk outside and peak up at the house to ensure two courses of ice and water have been installed. This will look like 2 courses of a 3′ roll along the bottom edges of the roof. It is usually black with a granular type surface. The courses installed on top of the ice and water will be a synthetic underlayment and will usually be a different color making it easy to tell the two apart. Reputable roofing companies will include the cost of this in their contract and will have enough work so that they do not need to cut corners to make more profit. This is why it is important to make sure you’re comparing “apples to apples” when comparing bids. One roofers bid may come in $1,000 less but will only last 17 years due to cheap underlayments and not enough ice and water installed. A higher bid will include name brand quality underlayments and six feet of ice and water. A roofing system with name brand shingles and better underlayments will generally last a good few years longer than a roofing system with cheap shingles and underlayments. This is why it is important to consider the cost of the roofs life more than the cost of the roofs install. A roof that cost less today will most likely cost a lot more in the future. 3. Step Flashing wasn’t included!? When roofing companies give an estimate, they can sometimes leave out small details like step flashing replacement. Step flashing is a part of the shingle roofing system and should be replaced when a new roof is installed. Step flashing can normally be a tricky thing to include in estimates because sometimes the step flashing is nailed to the wall behind the siding making it impossible to replace without completely removing and reinstalling large sections of siding. Removing and reinstalling siding can cost hundreds more than most people will not want to pay when they have a cheaper bid. This cheaper bid will most likely not include step flashing. Once the roofing contractor shows up and rips off the roof you may get a call saying “your step flashing needs to be replaced and it’s going to cost $700 more”. Or worse even they will not communicate this to you until the job is finished and then you will be stuck paying for something that should have been included. Many low bid roofing companies work this way. This can be avoided by making sure that step flashing is clearly defined in the contract. When the step flashing is nailed to the wall behind the siding we will give the home owner the option of leaving the old step flashing or performing the siding repair to be able to get the old flashing out. Leaving the old flashing in is fine in most cases as it will last the lifetime of the house when installed correctly. Step flashing only leaks when its made of a corrosive material and rots out after 30 years. Step flashing that is made of aluminum or galvanized steel will only ever leak if installed improperly by a low bidding roofing company. Step flashing is not to be confused with apron flashing. Apron flashing is usually one continuous piece of flashing that is installed horizontally along the bottom wall of any dormers, additions, or any wall to roof transitions such as porches or overhangs. It is fastened to the wall under the siding and usually protrudes about 4 inches over the top course of shingles. This flashing is typically not included in most roof replacements because it is attached directly to the sheathing on the wall and would need the siding to be removed to be replaced. Unless this is called for on an estimate it will not be included in the job and the roofing company will just re use the old flashing as it is made of a non corrosive metal and will last the lifetime of the house if installed properly. To prevent an issue from arising about step flashing, just make sure that all the roofing companies you are requesting bids from have included step flashing in the quote. Counter flashing is also a gray area on most contracts. Many roofing companies will not include this in a quote. The counter flashing is a part of the chimney and therefore does not fall on the roofers scope of work. Infinite Roofing will include an option to replace chimney flashing at an additional cost if it is needed. We started installing counter flashing due to our customers having a real hard time finding a chimney specialist to provide a quote for the work. Counter flashing is something that must be done by a very experienced roofing contractor as it requires a high level of craftsmanship. Be very weary of roofing companies that say they will include this for free. They are looking to do whatever it takes to sell the job and can not possibly provide the attention to detail that replacing the counter flashing requires for free. Shingles – Some of the worst roofing companies will quote you for a top quality shingle such as GAF and then actually use a far less quality shingle saving themselves about a $1,000 for an average sized roof. These roofing companies will get away with this for a while because many times the shingles are delivered to the top of the roof by a boom truck. When the shingles are delivered to the rooftop, the only way you can tell what kind of shingles are being used is to go outside and look for the name on the packaging when the used shingle wrappers are tossed off the roof to be put in the garbage. Ice and Water – Ice and water comes in many different brands and qualities. In order to receive a GAF 50 year full coverage manufacturer’s warranty you will have to use high quality name brand (GAF) underlayments. This complete roofing system is required by almost all shingle companies to receive their warranties. Shingle manufacturers do this because they know that their shingles will last a few years longer than roofs installed with poor quality underlayments. This means that if the roofers show up with a box of ice and water and the packaging doesn’t match the branding on the shingles. Your roof will most likely not be covered by a full coverage manufacturers warranty. The low bidding roofing contractor will tell you that you’re getting a manufacturer’s warranty and then show up with underlayments that cost about a third as much as the name-brand materials, saving the roofer around 500 dollars on your average sized roof. The contractor will get away with this one a lot as well because there usually is no one home checking to see that the right materials were used. Most often home owners do not even know to look for the difference in these materials. Using a roofing company that is certified by a shingle manufacturer will help prevent the use of lower quality underlayments. A lot of these contractors will be sneaky with how their contracts are worded and will be sure to cover themselves if they are found out. If the specific materials are not called out in the contract, then these shady companies are not held liable for the roofing system they might have told you that you were receiving. This is why it is wise to make sure any and all materials are specified in the quote. Say no to any contractor that asks you for all the money before the job is finished. Always ask for an invoice/receipt. Check the contract over thoroughly. Watch the materials that are delivered. Check the material brands listed on your quote/receipt against those that actually arrive. Count the plywood that arrives and count how much is actually used. As you can see, the roofing trade can be a very cutthroat business. There are so many underhanded tactics a roofing company can use to extort money from you. By arming yourself with the knowledge of some of these nefarious techniques, you can make yourself a much harder target. Most importantly, get everything written down and never rely only on verbal agreements. Whichever company you go with, we wish you all the best. Nobody deserves to be scammed and those disreputable companies definitely do not deserve your money. Roofing Contractors and Siding Installers serving the Capital Region, our company has 20 years of experience in roof replacement, repair and siding installation. Top rated and certified by GAF, James Hardie, Certainteed and IKO manufacturers. What that means for you is when we come out, we’ll give you an honest assessment, consultation and estimate on your new project to maximize your return on investment: whether that be for a new roof replacement, new siding installation, adding seamless gutters to your home or a simple repair for your existing roof or siding. New installation work comes with an in-house 10 year labor warranty, 50 year manufacturer warranty plus guaranteed financing options for all homeowners. We’ll get the job done fast, clean and right the first time.